Mark was out of town last night, so the boys invited me to accompany them to the local skate park. 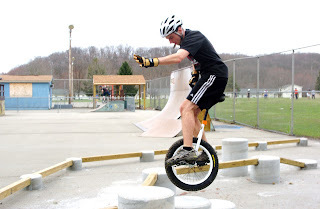 Just last year, a unicycle section was added to the park. After the skate park, we went to the local hot dog shop and sat shivering at a picnic table out front, eating not-so-good hotdogs, drinking diet root beer and talking. I miss Mark when he's gone but I do love spending time with my guys! On the way home, I was groovin' to a Beatles' CD when I stopped at a red light. Andy pulled up beside me and opened his window. He was groovin' to a different Beatles' CD. While waiting for the light to change, we sang along with his CD as loud as we could, "We all live in a yellow submarine, yellow submarine, yellow submarine." The day certainly started out great...breakfast with my friends, Deb and Lori. We've been meeting almost nearly monthly at 9:11 AM at a local restaurant for about five years for a real breakfast and current event session...current events meaning what's going on in our lives. Deb's kids went all the way through school with my boys and Lori's daughter graduated from high school with Tony and lives right next door to me. I always enjoy getting together with my friends and one fine day I might even remember to take a camera so you can see the three of us. I guess the thought of a Phillies' Santa scares the ??? out of Michael? Sophie, my newest grand-dogger, thanks to Michael and Catherine. 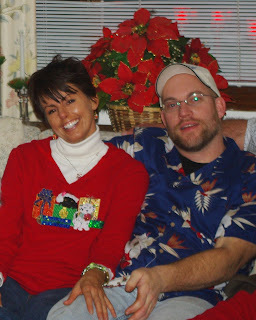 ﻿Vicky and Jamie (He doesn't always dress like this, the shirt was a (gag) gift). Do I really have to tell you who this adorable little fella is? 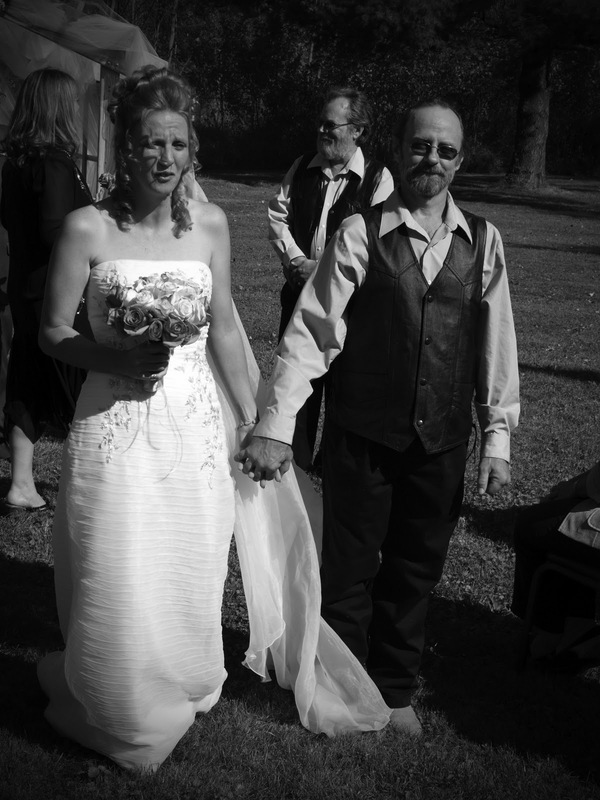 My brother, Daniel, and his beautiful bride, Leslie! There's more but I'll save them for another day. Hey, I'm outta here! Sweet dreams and God bless! On Tuesdays I volunteer at a local elementary school. I spend one hour with third grade and one with 6th. I love it! This morning I got ready extra early because I remembered that I had to stop and put gas in my car. That plan didn't work. I ran out of gas before I got there. Long before I got there. I ran out of gas in our garage! My cup is so full...I have to slurp from my saucer! Last night, some time between the 10 o'clock news and hearing my hubby and the dogs snoring (in three part harmony), I gave thanks to our God for the many blessings of the weekend and wondered if you might like to hear some of them too? * Meeting hubby for dinner after he participated in the Friday Night Bicycle Ride with the boys. It was cold and drizzly and once we were warmed from the inside out with warm and yummy clam chowder, we were so sleepy it's a wonder we could stay awake to drive home (all five or so blocks)! *Getting the news on Saturday morning that those strange noises my beloved front loader washer was making were probably fatal AND then finding out there were 3 more weeks left on the extended warranty!!!! *Calling for service, finding out that they would not be able to come until Wednesday AND realizing that we had enough clean clothes to last until then!!!! *A visit from Mom on Saturday, just to hang out...and seeing her come in the door bearing strawberries! *Mark, Andy, Tony and I taking Mom to Cici's Pizza for the first time and seeing the look on her face when she realized we weren't kidding, she could sit and eat pizza all day! *Being very thankful she didn't want to stay that long. *After watching the boys putting quarters into the vending machines and seeing them wearing fake teeth and stick on mustaches, being so thankful that just a tiny part of them hasn't grown up yet. *Time to listen to The Jane Austen Book Club on audiobook while piecing quilt blocks on my sewing machine. * While getting dressed for church, realizing that after a 35 pound weight loss, that I had nothing to wear! *Time to greet, hug and catch up with good friends and fellow believers before church services. *Standing next to hubby while making joyful noises unto the Lord (while everyone else was singing). *Glancing at my son during the sermon and realizing he was really fascinated. *A lunch date with hubby after a shopping trip to get new jeans for each of us (larger for some, smaller for others). *Watching my mother, and the rest of the Beaver Valley Choral Society, perform a beautiful and moving Easter concert. *Hearing my cuckoo clock strike 10 at 10:18. I love that thing but will never get it right! How about you? What are you thankful for this weekend?